As an established supplier of switchboards for tactical communication, Island Labs group enhanced their product portfolio with IP-based network nodes. Maintaining the concept of reliable voice communication, they allow access to central data servers with high bandwidth also. 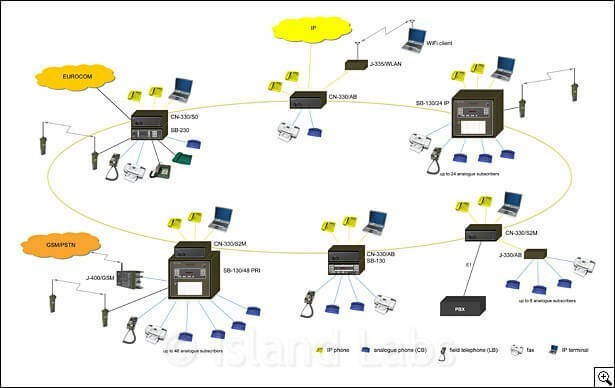 Each communication node owns a VoIP gateway, where the IP and the TDM world are linked together. It provides the capability of a VoIP server, which can be operated stand-alone, or as a client to a central communication server via SIP or H.323. This gives the advantage of local communication, even if the central server is not available. Alternative routes via a TDM network can be used, if applicable. The Communication Nodes CN-330 have two optical interfaces 100Base-FX, to be concatenated to each other. Optionally a ring structure is supported. The five electrical interfaces (10/100Base-TX) are equipped with Power over Ethernet (PoE), which make the additional power supply for e.g. IP phones dispensable. Various types of gateways cover all the relevant TDM interfaces (analogue a/b, ISDN S0 or ISDN S2M). The Communication Node CN-330 aside with our switchboards shape the ideal platform for all tactical communication duties. Now the switchboards are used as an access network for the military subscriber lines (CB, LB, 4-wire, CNR, EUROCOM) to the IP network. Consequently, they become an integral part of it. One standard numbering scheme does not make a difference between direct IP and connected switchboards subscribers. Legacy subscriber equipment such as existing field telephones can be used further on. This makes the migration towards a full IP network very economical. The SB-130/24 IP is an integrated switchboard and VoIP node, combining all the advantages in one compact shell. Using open standard interfaces provide full flexibility. E.g., the basic functionality can be enhanced with WiFi connectivity according to the new standard IEEE 802.11n. This allows not only the simple termination of wireless subscriber devices but in combination with directional antennas also line of sight node interconnections, where optical links are not applicable. Field telephones also have an advantage: using field wire, they can be connected across relatively long distances (CB = 10 km, LB = 30 km): IP telephones connected with a Cat 5 data cable, on the other hand, may only be about 0.07 km away. The network node can be operated instead of or simultaneously to, classic telecommunication networks (POTS/PSTN) and/or IP networks so that IP technologies can also be introduced gradually, either for a transitional period during which old systems are replaced (gradual migration) or for the continuous use of all network types (parallel operation). Voice communication is via a VoIP gateway which simultaneously supports the two protocol standards SIP and H.323. This enables the node to be seamlessly integrated into existing VoIP structures. Security via redundancy: For reasons of security, the VoIP gatekeeper functionality is not centrally set up: instead, it is set up decentrally on the VoIP gateways so that, in the event of an individual node failure, the entire network is not endangered. Configuration via a web browser: The basic configuration of the VoIP functionality is performed by a web browser and a password, i.e. on a standard computer, whereby this configuration can be created beforehand and in a quiet location: this means that no PC is required for actual operation. Various network nodes can be concatenated utilising optical fibre cable (daisy chain) or be operated in a ring topology. The maximum distance between two nodes may cover 2 km - 120 km. The daisy chain, therefore, creates very high network ranges. The net data rate per connection is 100 Mbit/s (Fast Ethernet). Two optical fibres per port enable real full duplex operation, ensuring a constant data rate. If required, the IP node is available with router functionality (optional), which means that Internet access or connections to other IP networks can also be set up. Hence, the network node SB-230 IP/GY offers maximum security and flexibility using redundancy, topology freedom and stable data rates over long distances. The electrical IP interfaces are equipped with “Power over Ethernet” (PoE 802.af), an internationally standardised remote supply technology for Ethernet which means that connected terminals (IP telephones, cameras, etc.) do not need separate power supply units. The network node – including its optical and electrical connectors – has been designed for use in harsh environmental conditions. It is waterproof and impact-proof, which means that it can be used outdoors without requiring any additional protection.